Welcome to the fourth Circle of fifths lesson. Below are detailed steps to understand and draw the major flats on the Circle of fifths diagram. Please read the first three lessons before continuing, as they contain background material needed in this lesson. This step shows how to memorize and draw the major flat scale labels on the Circle of fifths diagram. In 2. Major sharps, the phrase Father Charles Goes Down And Ends Battle was used to memorize the order of the tonic names of the scales. The next fact to memorize is Battle starts at 10 o'clock, as this is the hour position the phrase starts on the spiral, and then it moves counter-clockwise. 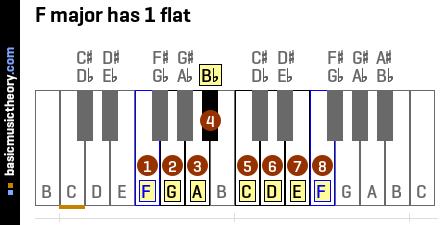 And finally, remember that F(ather) has 1 flat, and is the only major scale name in this lesson without a flat name in it. ie. all other words in the phrase are flattened.. B(Flat)attle, E(Flat)nds, etc. Here is all of that information in table form. The Circle of fifths diagram below is greyed out except for the items covered in this lesson. Starting at 10 o'clock, draw in the first letter B(attle), then write in the first letters of each word moving around counter-clockwise, adding a flat name to all of them. There will be one word left over after reaching the end of the spiral at 5 o'clock - Father, but this has already been drawn in when completing 2. Major sharps. And now from 11 o'clock, write in the number of flats (1), adding 1 each time, moving counter-clockwise until the end of the spiral is reached at 5 o'clock, with 7 flats. So for example, Battle is note Bb, which is the first note of the Bb major scale, and so on. The above information gives us the order of the notes as they appear on the key signature (ie. the note names, sharps and flats, in the correct order) of each of these scales. The remaining steps below take each scale in turn, and explain how to arrive at the key signature in each case, starting with the scale with the fewest flats - F major scale at 10 o'clock. 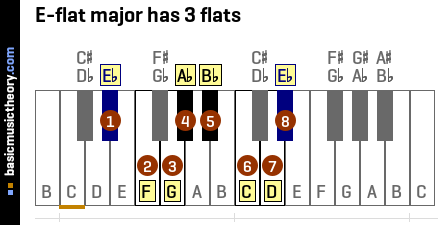 This step shows how to work out how many sharps and flats the F major scale has, using only the Circle of 5ths major scale labels. The F major scale is highlighted Circle of fifths diagram below. It has 1 flat note. But which flat note does it contain ? Again, the Battle Ends... phrase provides the answer. Simply take the next word in the phrase (.. the first word in this case) - Battle, and use that flattened note name. 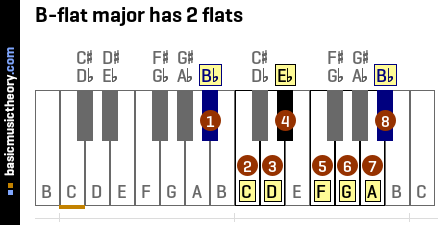 So the F major scale contains a single flat note - Bb, which is highlighted just below the diagram title below. 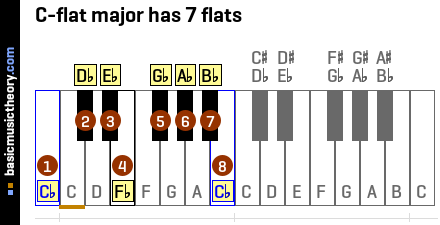 The treble clef from the F major key signature page matches - there is a single flat symbol on the Bb line of the musical staff next to the treble clef. The F major scale page shows this scale constructed 'longhand', by first working out the note intervals then deciding the note names. The F major key signature is now complete, and now we need to move around the circle of 5ths diagram by one position counter-clockwise, to 10 o'clock. As usual, just take the next word in the phrase, which (for major flats) will always be the note we have just flattened for this scale - Bb(attle). But again, what does this actually mean, from a music theory perspective ? 2. Major sharps used the 5th note in the current scale to identify the major scale of the next hour clockwise. But since we want to move counter-clockwise around the circle, the 4th note in the current scale will be used instead. 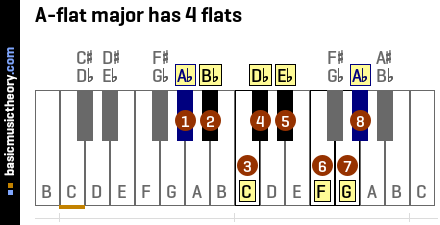 The piano diagram from this F major scale confirms that the fourth note is note B-flat, which is also our single flat note, so so the Bb major scale, will be covered in the next step. This step shows how to work out how many sharps and flats the B-flat major scale has, using only the Circle of 5ths major scale labels. Now we have moved to word, Bb(attle), tonic note of the Bb major scale. As we move around counter-clockwise, we know this scale contains one more flat than the previous step, so this scale has 2 flats in total. But what is the note name that has the flat accidental ? Again, just take the next word in the phrase (or look back one hour counter-clockwise) and use that flattened note name. The next word in the phrase after B(attle) is Ends, so the extra flat for this scale is note Eb. The final calculation of the flats in this scale is to take the key signature of the previous step, and add the flat we have just calculated to the end of it. The Bb major key signature page confirms there are 2 flat accidental symbols next to the treble clef symbol - one on the staff line for note B, then a second one in the staff space for note E.
Also, the Bb major scale page constructs this scale long-hand, by first working out the note intervals then deciding the note names. It too confirms there are 2 flats in this scale. We have again bypassed constructing this scale long-hand. The key signature of B-flat major is done, and now need to move around the circle of 5ths diagram again by one position counter-clockwise, to 9 o'clock, note Eb(nds). Again, the 4th scale note is used to identify the next hour position counter-clockwise, which the piano diagram confirms to be the note we have just flattened - Eb, which will have one flat more than this scale. Before looking at the next scale, it is worth noting that the remaining major flat steps follow the same patterns as described above. In each case, just look back to the previous hour position (1 hour counter-clockwise) with one more flat to get the name of the flattened note for the scale, add it to the previous key signature, then use that same flattened note as the next key signature for next step. 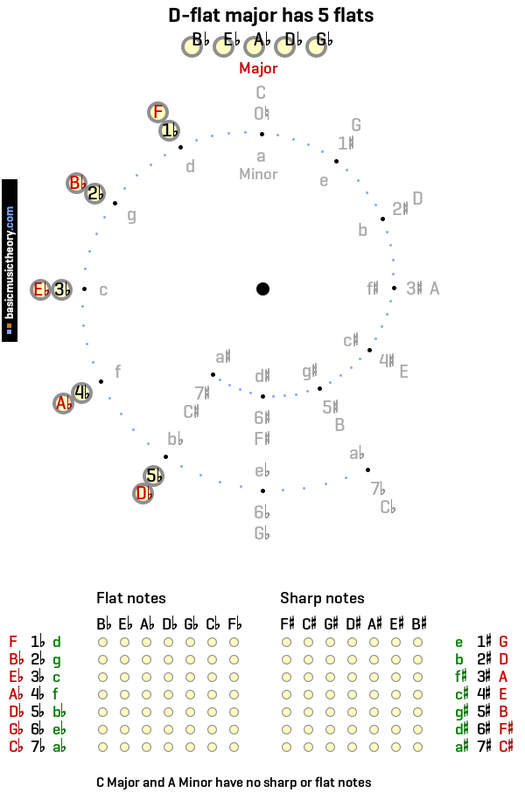 The spiral arm ends at Cb major scale, which has every note flattened, 7 in total. This step shows how to work out how many sharps and flats the E-flat major scale has, using only the Circle of 5ths major scale labels. Now we have moved to the 8 o'clock hour position - the Eb major scale. There are 3 flats in this scale, which is one more flat than the last step. The treble clef above confirms this, and since this key signature is done, we now need to move around the circle of 5ths diagram counter-clockwise one more time to the Ab major scale. 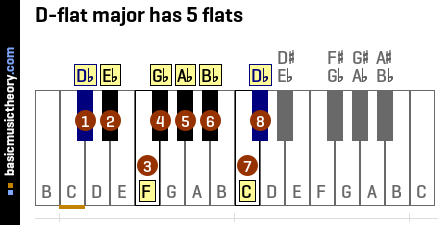 This step shows how to work out how many sharps and flats the A-flat major scale has, using only the Circle of 5ths major scale labels. Now we have moved to the 7 o'clock hour position - the Ab major scale. There are 4 flats in this scale, which is one more flat than the last step. The treble clef above confirms this, and since this key signature is done, we now need to move around the circle of 5ths diagram counter-clockwise one more time to the Db major scale. This step shows how to work out how many sharps and flats the D-flat major scale has, using only the Circle of 5ths major scale labels. Now we have moved to the 6 o'clock hour position - the Db major scale. There are 5 flats in this scale, which is one more flat than the last step. The treble clef above confirms this, and since this key signature is done, we now need to move around the circle of 5ths diagram counter-clockwise one more time to the Gb major scale. 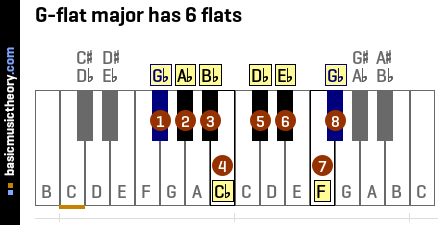 This step shows how to work out how many sharps and flats the G-flat major scale has, using only the Circle of 5ths major scale labels. Now we have moved to the 5 o'clock hour position - the Gb major scale. There are 6 flats in this scale, which is one more flat than the last step. The treble clef above confirms this, and since this key signature is done, we now need to move around the circle of 5ths diagram counter-clockwise one more time to the Cb major scale. This step shows how to work out how many sharps and flats the C-flat major scale has, using only the Circle of 5ths major scale labels. Now we have moved to the 11 o'clock hour position - the Cb major scale. There are 7 flats in this scale, which is one more flat than the last step. This is the final step of the major flat key signatures on the Circle of 5ths diagram, which started at F major at 11 o'clock, which has 1 flat, to this scale which has all / only flats in the key signature, finishing at 5 o'clock. The next and final lesson of this Circle of fifths lesson is 5. Minor flats - click to continue.